When a high school holds a celebration of its college-bound students, some choose to shout it from the rafters — sometimes, literally. In a booming voice honed from years of cheering on his basketball team at the Staples Center, Steve Ballmer rallied the college-bound seniors of Roosevelt High School at their recent Decision Day celebration. “Work hard, don’t give up,” shouted the LA Clippers chairman and former Microsoft CEO, who shared his experiences as a first-generation college student at Harvard and the lessons he drew from his early failures. Ballmer and his wife, Connie, who are the co-founders of the philanthropic Ballmer Group, toured the Boyle Heights campus May 2. Joining them was Nicole Hurd, founder and CEO of the College Advising Corps (CAC), which partners with 24 universities, including USC, to place 654 young college advisers at 646 high schools throughout the country, increasing college enrollment and completion for low-income, first-generation students. Adviser Stephanie Lopez helped 110 seniors gain acceptances to four-year colleges. 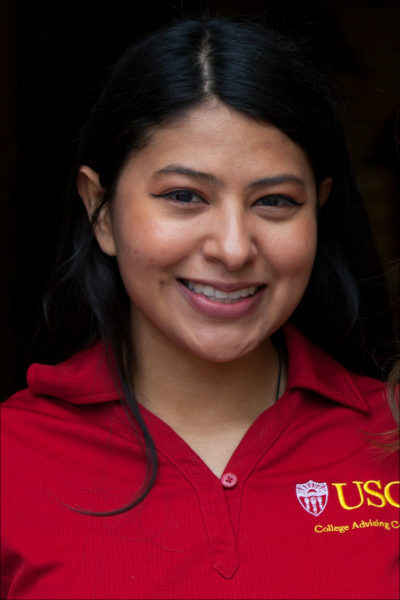 As Ballmer whipped up the crowd of seniors with whoops of “Go, Roughriders,” the spotlight turned to 25-year-old Stephanie López, Roosevelt’s USC CAC adviser. In her first year, she helped 110 students gain acceptances to four-year colleges, including USC, UCLA, UC Berkeley and Stanford. Roosevelt’s students are 98 percent Hispanic/Latino, and 97 percent are eligible for free or reduced-priced lunch. In its first 10 years, CAC programs across the country have helped more than 300,000 students enroll in college — despite the realities that students from the backgrounds that CAC most serves are far less likely to go to college than wealthier students. 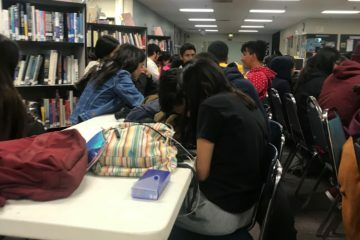 “Like all of our advisers, Stephanie is a dedicated, ‘near-peer’ to the high school seniors, and her recent experiences give these students a powerful example of resilience and success,” said Jerry Lucido, executive director of the Center for Enrollment Research, Policy and Practice, which runs the USC CAC. He joined USC Rossier Dean Karen Symms Gallagher at the Decision Day celebration. Last year, USC CAC advisers at 36 schools met one-on-one with nearly 9,000 students, resulting in 4,300 students receiving a collective total of 8,800 acceptances. Students who meet with a USC CAC adviser are 14 percent more likely to visit a college, 27 percent more likely to apply to college and 20 percent more likely to be accepted than students who don’t meet with a USC CAC adviser. Many of the students who visited Stephanie’s “College Corner” office throughout the year said they were already motivated to do well in school and do right by their families, but they didn’t always know how to translate that dedication into longer-term goals. “I knew I always wanted to go to college, but I didn’t know how to get there,” said Bestsayda, who is now headed to Stanford in the fall. 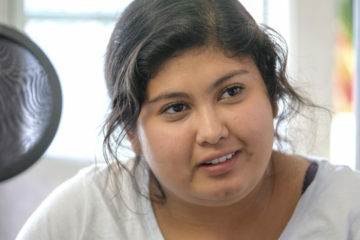 “And I knew I needed to get good grades, but I didn’t know what for,” admitted Nayeli. Having a near-peer adviser brought them a kind of support that didn’t exist at home or in the classroom. “She connects with you and she understands what it means to be first generation,” said Chris, who is planning to attend Cal State LA to study nursing. He emphasized how important it was to find support beyond the administrators or teachers. 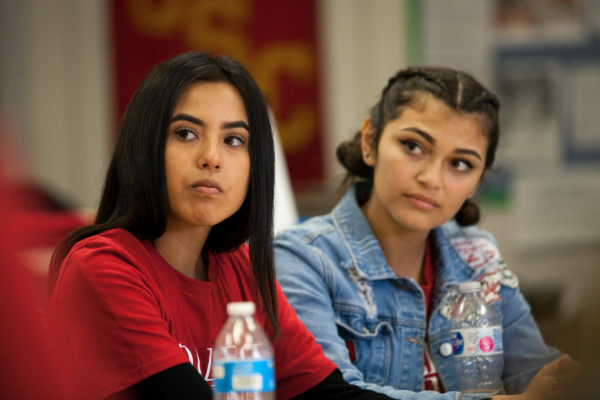 An important aspect of the USC CAC model is that full-time advisers placed at high school campuses focus on assisting students with the myriad of specific college access tasks, freeing up bandwidth for the rest of the campus counseling staff. Lopez knows that her own experiences can inspire the Roosevelt students. 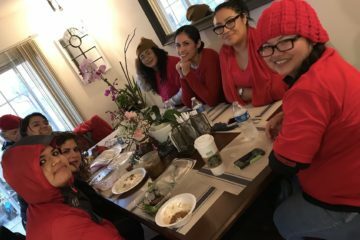 On a daily basis she tells them how college advisers told her she wasn’t good enough to go to college; how she worked hard for three years at Pasadena City College before transferring to UCLA; and how she dealt with her own disappointment earlier this year after receiving a rejection from a graduate school program. Photo above: Roosevelt High School seniors Karen (left) and Emelyn will be attending UCSB and Cal State Fullerton, respectively. All photos courtesy College Advising Corps. 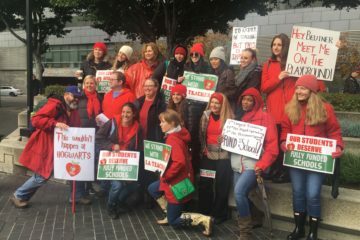 This article was originally published by the USC Rossier School of Education and republished with permission.